After losing his job at Doubleday, Bill Thompson moved to Everest House, but he and King remained good friends, going to lunch and attending baseball games together. In November 1978, Thompson approached King about the possibility of doing a book about horror in movies, television and radio over the previous thirty years. Since it would be a work of non-fiction, King wouldn’t have to offer it to his fiction publisher, NAL. At the time, King was living in Orrington, Maine and teaching creative writing and literature courses as a writer-in-residence at the University of Maine, his first experience teaching at the university level. In the evenings, he was finishing work on Firestarter. The concept intrigued King, but he wasn’t enthusiastic about the project at first. It intimidated him. It was easier to tell lies in fiction than write the truth in non-fiction, he thought. It wouldn’t be his first time writing about the nature of fear and why people want to be scared by something entertaining, though. He’d prepared a long forward on the subject in Night Shift, for example. Thompson was persistent and persuasive. He asked King how often he had been asked why he wrote horror and why people read horror. If he wrote this book, King would never have to answer those kinds of questions again, Thompson argued. All he’d have to do is say, “I wrote this book.” It would be his “Final Statement” on the matter. The timing was right, too. The night of Thompson’s call, he was working on the syllabus for a class called “Themes in Supernatural Literature” he would be teaching the next semester. The class gave him the ideal platform to work out some of his ideas on the topic, with his students challenged his thinking on some subjects. He was also influenced by a lecture given by his former University of Maine professor, Burton Hatlen, on Stoker and Dracula, a book that King admitted had occupied his mind while on vacation in St. Thomas that winter. King said later that he found it a very difficult book to write. It involved a lot of research, but he didn’t want it to look that way in the final product. He interviewed—by letter—the authors whose novels he focused on in the chapter on Horror Fiction. Some of the material was “repurposed” from previously published writing, including the essays “The Fright Report” (Oui) and “The Third Eye” (The Writer), introductions to Night Shift, and an omnibus edition of classic horror novels, and an article about Ramsey Campbell from Whispers magazine. The topic could take years to explore if he included the origins of horror in the earliest writings, he realized, so together he and Thompson decided to limit the scope to the previous thirty years or so, ending in 1980. He chose the fifties as his starting point because there were no horror books or movies to speak of in the forties. The fifties also was the beginning of his personal experience as someone appreciating the genre. One aspect of the book that surprised people is the “annoying autobiographical pause,” the first time King had written about himself at length. This part came about because of the inevitable Freudian questions about what happened in his childhood to make him the way he was. The list of books and films at the end of Danse Macabre came about as a result of a late-night drinking session at the U.N. Plaza Hotel in New York and another at a pub in North Lovell, Maine with his agent, Kirby McCauley. 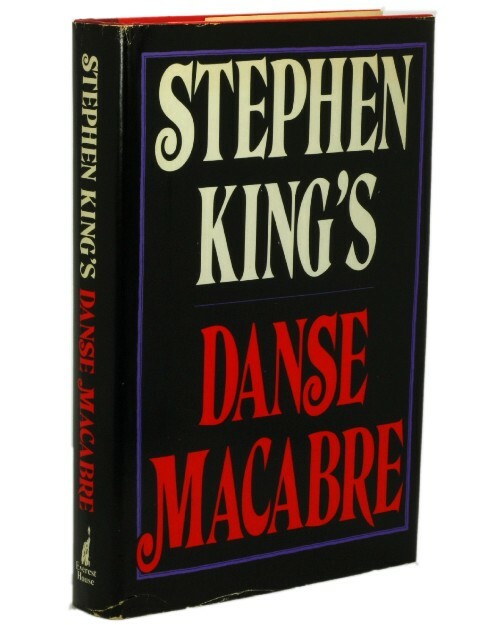 Danse Macabre was published in April 1981 with a first printing of 60,000 copies. There was also a numbered edition signed by King, limited to 250 copies. A location that should be familiar to Dark Tower fans: it’s where Mia went to await a call from Richard Sayre in Song of Susannah. King subsequently asked Dennis Etchison to comb the published book for errors, which were corrected in the 1983 paperback version, along with any mistakes reported by hundreds of readers. This edition also contains a new “Forenote to the Paperback Edition.” The 2010 edition of the book has both introductions and an additional essay entitled “What’s Scary” that originally appeared in Fangoria magazine. I love this book. Probably the one I dip into the most. I’ve been trying to watch the film list for years, but some of the films have been tricky to track down. I got this book right after it came out and have read it at least 4 times. I love it! Bev, Any idea on how many copies of Dance Macabre have been sold to date? No, sorry — I don’t keep track of such things. I doubt anyone really does. I discovered so many great horror fiction novels by reading Danse Macabre! Loved King’s in-depth discussions on Harlan Ellison, Richard Matheson; and two of my all-time favorite novels, “The Haunting of Hill House, and “The House Next Door.” I’ve read my paperback edition of “Danse Macabre” to tatters. Mark me down as a lover of this book too! It’s a great history of the horror genre and a good reference guide for those new to it. I’m also doing going though Stephen King Re-visited this year. (Currently on ‘It.’) Danse and On Writing are the only two King books I hadn’t previously read. Didn’t care much for Danse – perhaps because most of the fiction talked about I am too young to appreciate? Some of WHH’s stories were in Alfred Hitchock Presents… anthologies — King may have misremembered the details in this case. I’m a big fan of this book, too. I’ve been trying to collect the film list at the back off and on for about twenty years with moderate success. I love his observations about terrible movies. The Robot Monster anecdote is hilarious! I’ve only been able to see some of them recently thanks to YouTube. I can’t imagine trying to collect them! Ebay has been a big help. Some are only available on old used VHS copies. There are a handful that I’ve had no luck whatsoever in tracking down. Great Essay Again BEV! would you by chance have the ISBN # of the first paperback edition with the corrected errors/changes? now i have to have that copy, along with my signed limited and first first hardback (flatsigned). Another great essay BEV! My paperback edition of “Danse Macabre” is still in pretty good shape, and it is a wonderful history of horror genre. I love it! !